Patrick Hayes statement in Red Action following his arrest. Charge of the New Red Brigade, The Independent. This article asks who Red Action are following Hayes’ arrest. Violence with Violence, World in Action (ITV) investigates anti-fascist groups. 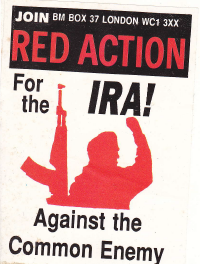 This entry was posted in Anti-Fascist, Your Archivist and tagged Ireland, London, PIRA, Red Action, video. Bookmark the permalink.